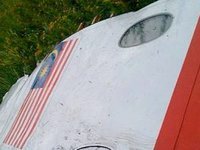 Ukrainian Defense Minister Stepan Poltorak believes that the information provided by Russia about an allegedly Ukrainian Buk missile, which shot down flight MH17 over Donbas in 2014, shows that Moscow has not abandoned its plans to aggravate the situation. "This is another lie. This is another fake of the Russian Federation, which shows that Russia has definitely not abandoned its plans to undermine the authority of Ukraine, to undermine the situation as a whole. They need a reason to aggravate the situation," Poltorak said at a briefing after a meeting with British Defense Secretary Gavin Williamson in Kyiv on Monday. Williamson, in turn, added that an independent investigation had shown who was involved in the attack on the Malaysia Airlines flight MH17. This is another example of Russian disinformation, Williamson said.